Okra is a warm season plant in the hibiscus family. The immature pods are used in soups, stir fries, and stews. 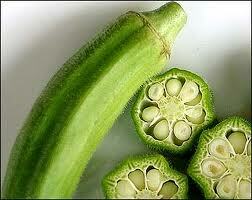 The mucilage in okra acts as a thickening agent in soups, such as gumbo. It is a popular crop among many new immigrant groups in New England, including Asian Indians and Brazilians. Okra does best in warm weather and will die with frost. Most varieties have hairs on all parts of the plant that can cause skin irritation, so gloves and long sleeves are recommended for harvest.